Asus is aiming to prove that gaming power comes in modest sized packaging by releasing the quiet but punchy G20CB. 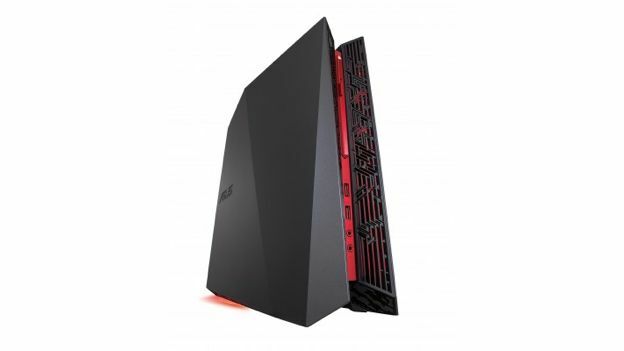 Produced by Asus' Republic of Gamers (ROG) arm, the G20CB takes the form of a red and black 9.5-litre desktop machine that boasts the shiny new Intel Skylake architecture and a powerful Nvidia GeForce GPU. When it comes to exact specifications, it can be packed with a sixth-generation Intel Core i3, i5 or i7 chip and in the GPU department the Nvidia GeForce lineup includes a range of options that top out at the GTX 980. Getting further inside the modest shell, it has 4GB of DDR4 RAM that is upgradeable to 32GB and up to a 3TB HDD or 256GB SSD. Both the memory and storage provides huge uplifts in access speed compared to previous machines. Keeping things cool is never far from the front of a gamer's mind and the G20CB has an integrated thermal design that uses natural convection, a hidden airflow channel and two internal fans plus copper pipes to circulate the heat. The result is a machine that produces just 22dB of noise, something that is apparently quieter than most libraries. It also lays on as many as eight different USB ports, Bluetooth 4.0, Wi-Fi, a Blu-ray combo drive, a wireless backlit gaming keyboard and exclusive Aegis II software with GameAlive to provide the best performance possible. Buyers interested in this little beast are advised to contact their local stockist.